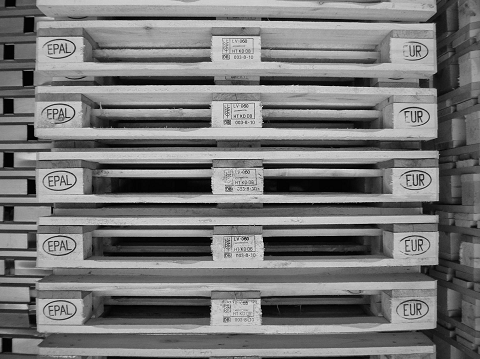 The europallet is the most used pallet in Europe. According to an announcement of the European Pallet Association e.V. 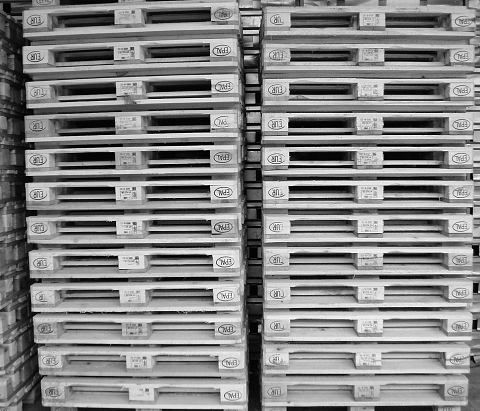 (EPAL), 66.3 million europallets were manufactured in 2014. With dimensions of 1200 x 800 x 144 mm (L x W x H) and an extremely high load capacity, the euro-pallet has become one of the most indispensable exchangeable load carriers and is the heart of every logistics specialist. The europallet is manufactured in a certain production process with an extraordinary control system. They are standardized according to the International Union of Railways and conform with the guidelines of the European Pallet Association (EPAL). The EPAL and UIC control staple proves the genuineness of the pallet on the one hand, on the other hand it guarantees security against forgeries. Due to the exchangeability of the euro-pallet the flow of goods ultimately becomes simple and unsophisticated. The euro-pallet is is a four-way entry industrial pallet, which means that a forklift or a pallet jack may access and transport it from all four sides. This allows maximum flexibility and extremely convenient handling. Many production and packaging cycles in all branches of industry are standardized in accordance with the euro-pallet. From January 1st 2010 all europallets are produced involving mandatory IPPC heat treatment. Our Euro pallets are treated according to the IPPC Guidelines, including the International Standards For Phytosanitary Measures No. 15 (ISPM 15). They meet the strict requirements of the IPPC, the International Plant Protection Convention and are suitable for export worldwide. Our product range includes new europallets with IPPC-treatment as well kiln-dried europallets with a residual moisture content of 15-20%. With us you will also find the appropriate accessories, such as pallet lids and pallet collars, which protect the transported goods or can expand the use of the europallet further. You can contact us by phone, email or use our online form. We are here for you!